"Sampath Speaking" - the thoughts of an Insurer from Thiruvallikkeni: Ship ran aground at Margate ~ misses statue at Kent Sea front !! Ship ran aground at Margate ~ misses statue at Kent Sea front !! Visitors to Margate will notice the figure of a watchful iron man standing on the seafront, partially submerged by sea. This new addition to the sweep of the Kent resort’s sandy bay is the work of sculptor Antony Gormley, best known for his monumental Angel of the North. Can’t understand why a statue in the sea waters ? it is stated that at high tide, the sculpture is completely submerged in the sea while at low tide it is visible from the museum's balcony. Margate is a seaside town in the district of Thanet in Kent, England. Remember well that Chepauk Test in Jan 1977 – Tony Greig captained England to a great 200 win in a series otherwise marred by the ‘vaseline incident’ of John Lever. At Chepauk, it was the 3rd Test of the Series – Indians responding to 262 were shot out for 164 ~ RGD Willis ran in fast, long and furious and it was a sight to look at – there was Chris Old and the wily Derek Underwood but it was the left handed John Lever who took a 5 for … In their second innings England declared at 185 for 9; with Chandra taking 5 and Prasanna 4. Set to score 284, India gave a pathetic display getting dismissed for a paltry 83. RGD Willis took 3; John Lever 2 and Underwood 4. There was the mercurial Alan Knott who jumped and pouched with aplomb and swept with equal ease. Derek Underwood and Alan Knott came from Kent…. ~ a county in England which has a nominal border with France through the Channel tunnel and a boundary with Essex in the middle of the Thames Estuary. Kent's location between London and continental Europe has led to it being in the front line of several conflicts, including the Battle of Britain during World War II. England relied on the county's ports to provide warships through much of its history; France can be seen clearly in fine weather from Folkestone and the White Cliffs of Dover. Because of its relative abundance of fruit-growing and hop gardens, Kent is known as 'The Garden of England'. Sir Antony Mark David Gormley, is a British sculptor. His best known works include the Angel of the North, a public sculpture in Gateshead in the North of England, commissioned in 1994 and erected in February 1998. Gormley's career began with a solo exhibition at the Whitechapel Art Gallery in 1981. Almost all his work takes the human body as its subject, with his own body used in many works as the basis for metal casts. You are reading all these because, a 75-metre cargo ship full of broken glass ran aground off the Kent coast - narrowly missing a statue by sculptor Anthony Gormley. 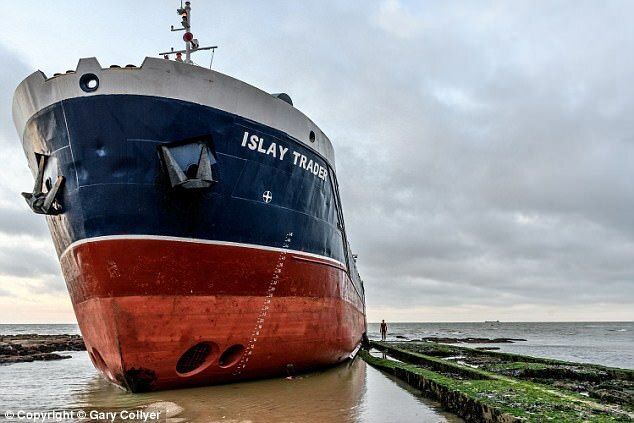 MailOnline reports that shortly after 3am on Sunday the UK Coastguard received reports that the cargo vessel Islay Trader had dragged anchor and run aground near Margate Harbour between 30m and 50m. The ship came within feet of a life-sized iron statue by the Turner Prize-winning artist. A Coastguard spokeswoman said that the fuel tanks had not been damaged and the risk to the environment was 'very low'. She added that a tug was being organised to refloat the vessel, which is registered in Barbuda. She added that there was no risk to life and the crew remain on board in preparation for an attempt to refloat and tow the vessel to safety around midday on Sunday, with the next high water. 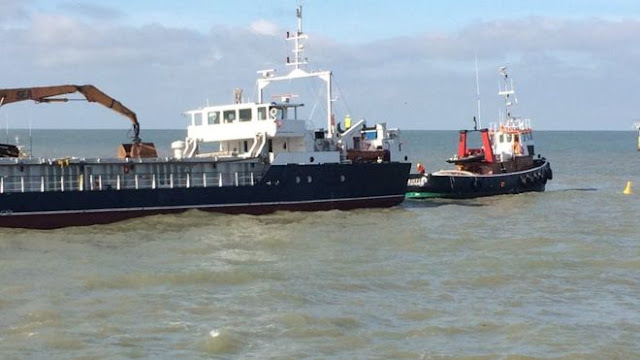 Later reports reveal that the ship's agent arranged for a tug from Medway; the Maritime and Coastguard Agency's counter pollution and salvage officer worked with the vessel's shipping agents during the recovery operation and the Marine Accident Investigation Branch too had been informed. There was no pollution or damage to fuel tanks. Reports further confirm that the vessel was towed from the sea bed with the assistance of a tug 12 hours later, and is now planning to continue its journey to Antwerp, in Belgium.